As true Celtics fans, we are attempting to deal with both excitement and sorrow. The 2017 NBA draft and recent trades have created a feeling of optimism and hope in all of us. But there is never a free lunch, and we have suffered some hurtful losses. Avery Bradley and Jae Crowder were valuable members of the Celts starting unit. Now they are gone. But the painful loss of Isaiah Thomas to trade will be felt for a long time. The above tweet focusing on the Isaiah Thomas/Kyrie Irving trade reveals to me how Isaiah has been undervalued for his entire NBA career. He was drafted 59 picks after Irving. There should be no one who would argue that there is that much of a difference in talent. He has been a member of four teams in six years. He just keeps getting traded. Isaiah Thomas came to Boston from the Phoenix Suns in a three-team trade on February 19, 2015. He guided the Celts into the playoffs, but Boston was swept in the first round by the Cleveland Cavaliers. The following year saw the Celtics in the playoffs again. They lost in the first round to the Atlanta Hawks four games to two. In the 2017 NBA playoffs, Boston got to the Eastern Division finals but lost to the Cavs four games to one. As Isaiah's game improved, so did the team's performance. The 2017 playoffs were a combination of drama, excitement and sorrow. The video below is difficult to watch. It shows Avery Bradley consoling Isaiah on April 16, one day after the death of his sister, Chyna Thomas. Isaiah played in that first-round game against the Chicago Bulls despite the pain and grief. Boston legend Tommy Heinsohn told me before Game 1 of the Wizards-Celtics second-round series there are three Celtics he’s watched in his 82 years that make him say,“How did he do that?”: Bill Russell. Larry Bird. And Isaiah Thomas, which shouldn’t come as a surprise if you witnessed Thomas score 53 points in the Celtics’ 129–119 overtime Game 2 win over the Wizards. It’s not just the tough shots he’s hitting over defenders that provoke that kind of response. How did he do that is the recurring question of Thomas’s postseason. I, like many others, underestimated Thomas' ability. In my fantasy basketball drafts, I usually waited too long to take him. When my next pick was on the board, he was gone. But Isaiah knows how good he was, and he demonstrates it repeatedly. The video below contains highlights of Isaiah's 53-point game. As fans, we want our team to win and do whatever is necessary to accomplish the goal. But most of us would also like to see compassion and empathy when trades need to be made. I realize that in today's NBA that is a difficult task. 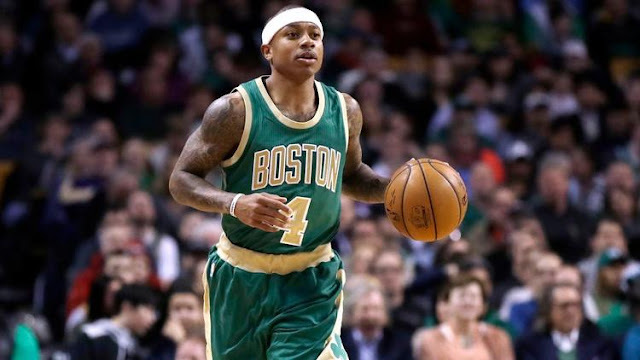 Isaiah Thomas put his heart, soul and energy into making the Boston Celtics a better team. He succeeded. I wish there had been a way to keep him. Did Tom Heinsohn go too far in comparing Isaiah to Russell and Bird? I don't think so. There are players who can will their teams to victory or compel themselves to perform at a high level under adverse circumstances. In the 1969 championship game against the Lakers, balloons had been placed in the ceiling of the Los Angeles facility in anticipation of a Lakers victory. Russell took opposing guard Jerry West aside and told him (via complex.com's Doug Sibor): "Those f***ing balloons are staying up there." And stay there they did as Boston emerged victorious. Larry Legend's epic shooting duel with the Atlanta Hawks' Dominique Wilkins and his courageous return to the playoff game against the Indiana Pacers after being knocked unconscious showed amazing will power. All three of these exploits can be found in the complex.com article by Doug Sibor, The 25 most badass playoff performances in NBA history. Isaiah's 53-point game needs to be added to that list. When he returns to TD Garden the first time there will be cheers that will rock the structure. Like Paul Pierce, Isaiah Thomas totally deserves that. His 53-point game while grieving such a loss will always be an important part of Celtics history and NBA lore. Tom Heinsohn was right. Isaiah Thomas belongs with Bill Russell and Larry Bird as far as accomplishing things on the court that seem virtually impossible. He is in good company.